The Broadcasters Foundation of America has established the Joseph M. Bilotta Memorial Fund in honor of the veteran broadcaster who passed in Connecticut this past Friday, June 1, 2018, from pancreatic cancer at the age of 69. The Memorial Fund will support the Foundation’s mission of providing aid to past and present members of the broadcasting profession who have fallen on hard times. The Broadcasters Foundation is the only charity exclusively devoted to helping broadcasters in acute need. Bilotta spent more than 40 years at Buckley Broadcasting where he helped build the group’s standing through such noted stations as WOR-AM in New York and WDRC-AM/FM in Hartford. Following his ten-year stint as Chief Operating Officer, he became President and Chief Executive Officer in 2011, following the sudden death of company founder, Rick Buckley. Bilotta celebrated his 45th anniversary with Buckley Broadcasting in July 2014. Upon the conclusion of the sale of the Buckley Broadcasting’s assets in 2015, Bilotta formed JMB Solutions. Bilotta was saluted by his colleagues in April with the coveted Ward L. Quaal Leadership Award, given by the Broadcasters Foundation of America at a breakfast ceremony held during the 2018 NAB Show. He Chaired the Radio Advertising Bureau’s Board of Directors, served a six-year term on the National Association of Broadcasters Board, was a Lifetime member of the New Jersey Broadcasters Association Board, and an Officer on the Broadcasters Foundation of America Board. 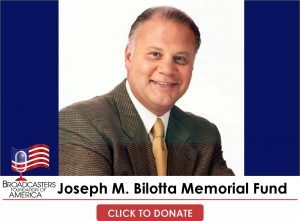 To donate to the Joseph M. Bilotta Memorial Fund, please visit www.broadcastersfoundation.org, call 212-373-8250, or email info@thebfoa.org. For those wishing to pay their respects, calling hours will be Wednesday, June 6th, from 4-8 pm in the Lesko & Polke Funeral Home, 1209 Post Road in Fairfield Center. Funeral services will take place on Thursday at 9:15 am in the funeral home and at 10:30 am in Saint Thomas Church, 1719 Post Road, Fairfield. To order flowers online, for travel directions, or to sign his guest register, please visit www.LeskoPolkeFuneralHome.com, which includes a link to Bilotta’s obituary.